This is the first effort at trying to change a very bad habit of mine, which is to throw away plant labels and not write down what plant cuttings I have, just relying on memory to serve up the appropriate plant and its requirements. It doesn’t work. Instead, I’ll be taking pictures and noting down what’s what so I can recall with confidence that although there appear to be two columns of Osteospermum cuttings, one has vibrant fuschia flowers and is hardy, the other has intense yellow, and is not. If you’re really good, you may be able to tell which one is which from the leaves. 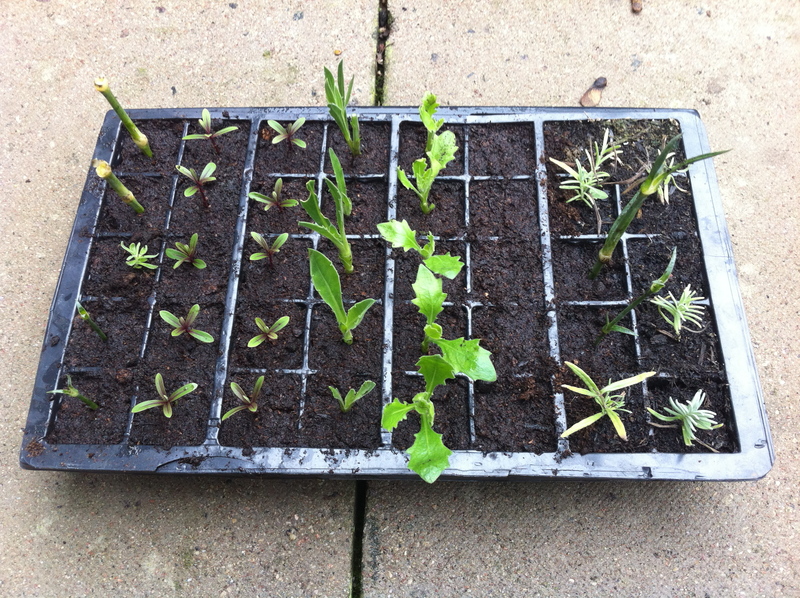 It’s quite a risky time of year to be starting cuttings since the weather may suddenly turn very cold. We’ll have to see what survives. Of course, this tray will go in the plastic greenhouse for protection.